I'm documenting this here as I spent ~3 days on and off trying to get my head around these specific problems and there was surprisingly little on the web. I have a HP ProLiant Gen8 G1610T which I want to use as a media server so I bought 2 x 4 TB WD RED HDDs to stripe for ~8 TB of storage capacity. Used the Smart Storage Administrator to create a 8 TB RAID 0 / striped volume. Booted to a Windows installer USB flash drive (Rufus + SW_DVD9_Win_Svr_STD_Core_and_DataCtr_Core_2016_64Bit_English_-2_MLF_X21-22843.ISO). Loaded the driver HP Dynamic Smart Array B120i/B320i SATA RAID Controller (http://h20564.www2.hpe.com/hpsc/swd/public/detail?sp4ts.oid=5387585&swItemId=MTX_07615039b81a44fda3bf51e9ac&swEnvOid=4231). Selected the ~7.2 TiB volume. Installed Windows Server 2016 Standard. This worked fine but there was only a 2 TB partition which couldn't be extended as it was initialized as MBR. As advised by http://www.thewindowsclub.com/convert-mbr-to-gpt-disk, I tried to convert the partition from MBR to GPT but it didn't work. I looked for how to change the "BIOS mode" from legacy to UEFI to allow booting to a GPT-initialized drive but, according to many sources (https://community.hpe.com/t5/ProLiant-Servers-Netservers/Microserver-Gen8-UEFI/td-p/6499756, http://homeservershow.com/forums/index.php?/topic/9643-how-to-enable-uefi-in-microserver-gen8/, https://community.hpe.com/t5/ProLiant-Servers-ML-DL-SL/ML350p-Gen-8-UEFI-bios/td-p/6293177), the only HP ProLiant Gen8 to support UEFI is the DL580. I used Command Prompt / diskpart to clean, partition, format, active, assign etc both RAID volumes but still encountered the same errors. I cleared the RAID config and did the same as attempt #1 except created only a 250 GB striped volume but still encountered the same errors. I cleared the RAID config and did the same as attempt #1 but still encountered the same errors. During my extensive DuckDuckGo- and Google-ing, I read something that recommended removing all USB drives but I dismissed that thinking "What? I'm installing off of a USB flash drive? How would that work?" 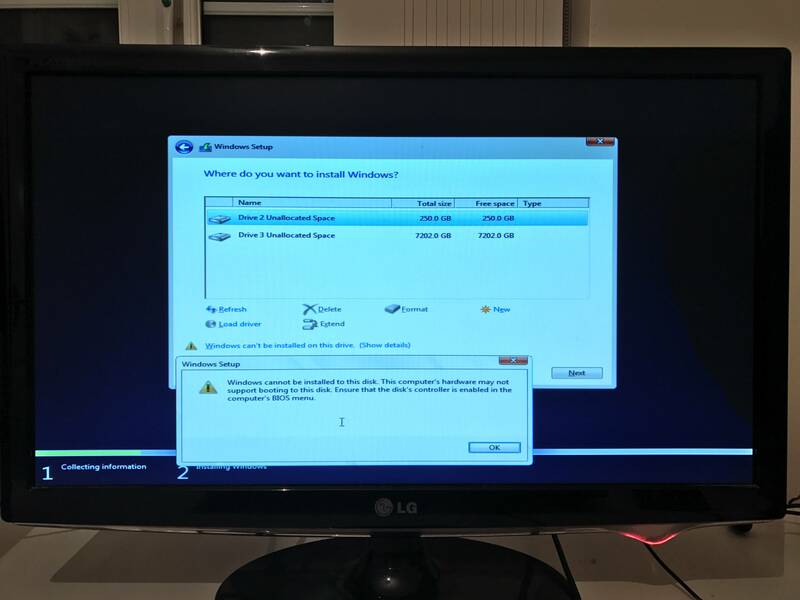 Apparently, the problem was indeed that a USB flash drive was connected - my other USB flash drive (the one containing the RAID controller driver). Connecting my other USB flash drive post-boot worked absolutely fine. 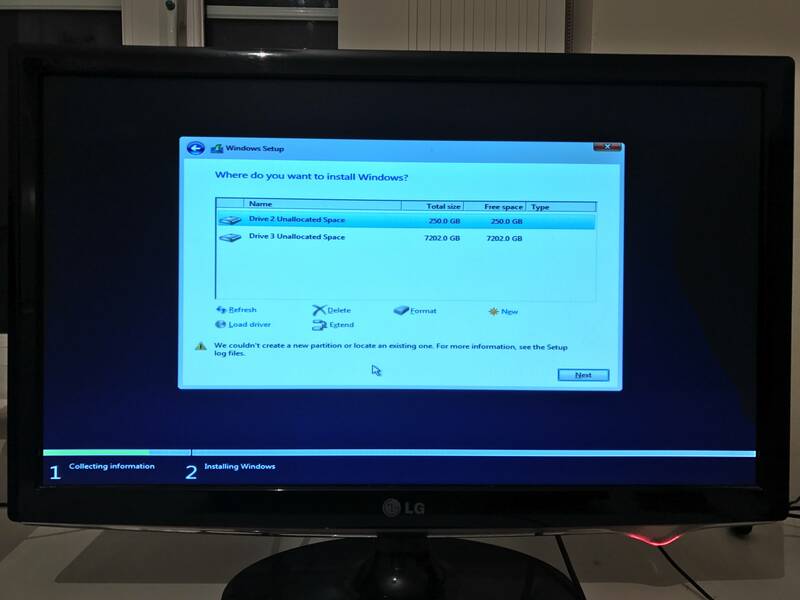 This is what I unknowingly did in attempt #1 - I booted into the Windows installer, saw that it didn't have a driver for the RAID controller, downloaded it on my PC to my other USB flash drive, and then connected it. Bizarre but there you have it. Also, I don't know if it's relevant but the problematic USB flash drive is USB 3.0 and has FalconFour installed. Not the answer you're looking for? Browse other questions tagged windows raid hp-proliant windows-server-2016 or ask your own question. Will I lose current disk contents if I re-enable onboard RAID on a ProLiant DL320 G5 server? BIOS to UEFI no backup restore possible? HP ProLiant MicroServer Gen 8 - Hard Drive Configuration?